Chocolate lovers unite! 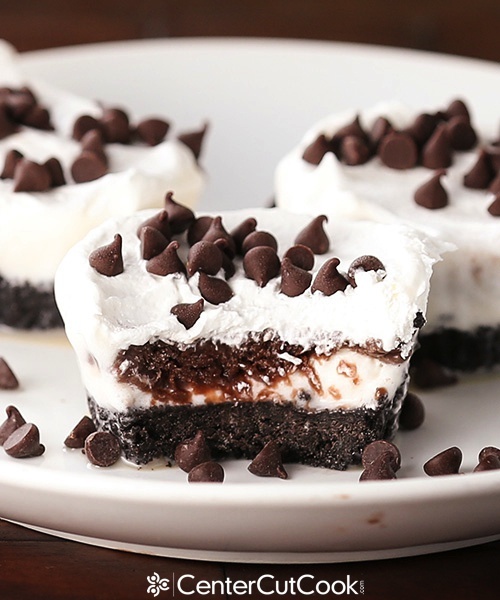 These Chocolate Lasagna Cupcakes offer layer upon layer of yumminess, and can easily be turned into the perfect frozen summer treat! Because Chocolate Lasagna is one of Ryan’s favorite desserts of all time, I decided to re-visit it and turn it into an awesome, cool, summery treat that could be enjoyed pool-side, at your 4th of July picnic, or on a random June, October, or March evening. Meet the Chocolate Lasagna Cupcake! Not only did I turn this oh-so-popular dessert into cupcake form, I also made a version with ice cream! SoSoSo delicious, and cool, and refreshing. Are you ready? I used my food processor to crumble the cookies which makes it SO easy to do! The second thing I’d like to say about Chocolate Lasagna Cupcakes is that you will get about 24 from one batch. 24 perfect little single serving cupcakes that you can share with family and friends, and they will adore you for your willingness to share! It is really important to firmly press the Oreo mixture (crushed Oreos and butter) into each muffin cup. I used the back of a measuring cup to help with this part. I made two versions, the first version I used the traditional ingredients for the white layer (cream cheese, sugar, Cool Whip), the second version I used vanilla ice cream. Woah. Talk about the perfect frozen treat! We loved both versions, but if it were a really hot day, I’d definitely choose the ice cream version over the traditional. I’ll include instructions below so that you can choose which option suits you best. Let’s talk about the pudding layer, shall we? Because that’s what comes after the cream cheese or ice cream layer. Yes, I used instant pudding. Yes, I am okay with that. If you are not, feel free to make your own chocolate pudding. Can I let you in on a little secret? I have never tried homemade, from-scratch pudding. Some of you were so kind on the Chocolate Lasagna recipe to let me know that I am missing out. Some day, I will make it, but for now, instant pudding it is. After the pudding layer comes a little more Cool Whip/whipped topping/whatever you would like to call it. If you are unfamiliar with Cool Whip, or it’s not available where you live, it’s essentially processed whipped cream. Whatever they add to it makes it stable so that it doesn’t deflate and turn to liquid. If you search for a stabilized whipped topping recipe on Google, you may find an option that works for you. I haven’t tried any of these options to confidently tell you that it works with this particular recipe. Now for my favorite part. After you’ve constructed these cute little cupcakes, you’ll top them with mini chocolate chips then pop ’em in the freezer. If you made the traditional version (sans ice cream), you’ll want to freeze them for about an hour before eating them. If you made the version with vanilla ice cream, allow them to set-up in the freezer for 3-4 hours. Here’s an important little tip – while I store leftover Chocolate Lasagna in the refrigerator, I decided to store these little cupcakes in the freezer this time. Obviously you’d store the ice cream variety in the freezer if you choose that route, but I froze the traditional cupcakes in the freezer too and guess what? They were awesome frozen! 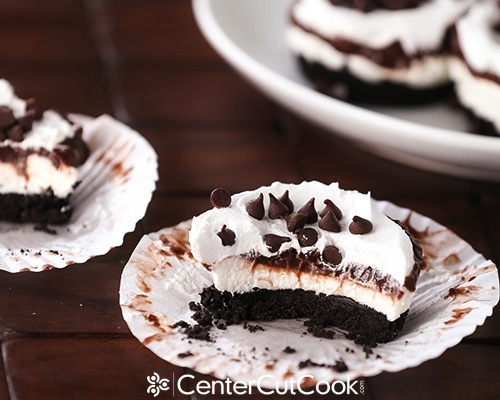 Chocolate Lasagna Cupcakes made the traditional way with a cream cheese layer: store in the refrigerator or freezer. Your choice. The frozen version is awesome! Chocolate Lasagna Cupcakes made with vanilla ice cream: store them in the freezer, unless you want a melty mess all over your fridge. Below: This is the ice cream version! Can you tell a difference? 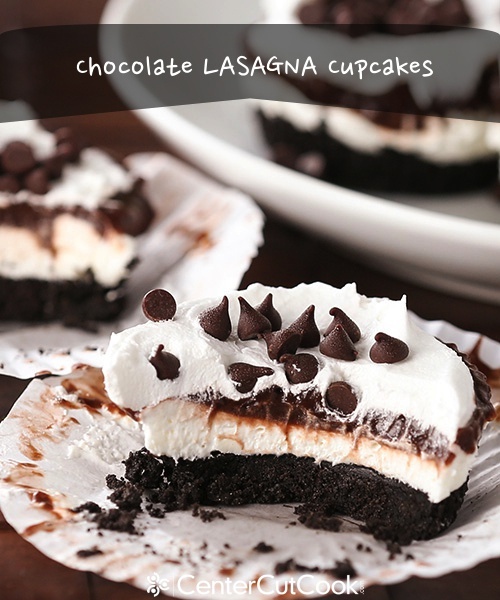 They look very similar to the traditional Chocolate Lasagna Cupcakes! 1. I used a Norpro Stainless Steel 1 tablespoon cookie scoop for every single layer of these cupcakes. It helped tremendously! You can check it out on Amazon. 2. Use a food processor to crush the Oreos. You can also put the Oreos in a big ziplock bag and use a rolling pin to crush them (and remember, you use the WHOLE cookie), however a food processor will make this step so much faster. 3. If you make the ice cream variety, let the ice cream soften up a bit before you make these. It’ll make it so much easier for you to flatten the ice cream and spread it to cover the whole cupcake. 4. If you make the traditional version with the cream cheese layer, be sure your cream cheese has softened, otherwise it will be chunky and clumpy! 5. You can make these days ahead of time and they will be perfectly fine! If they’ve been in the freezer for a day or two and are frozen solid, let them sit at room-temperature for about 10 minutes before serving. 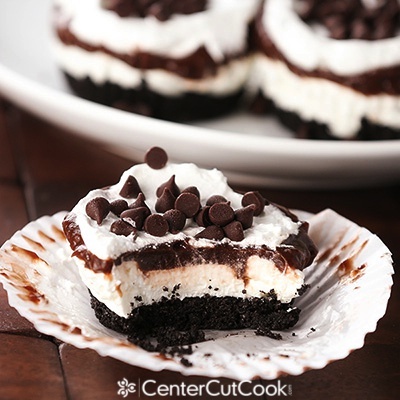 I <3 Chocolate Lasagna Cupcakes! Enjoy! 1 package regular Oreo Cookies, about 36 cookies. *You will use the WHOLE cookie, cream and all! Crush 36 Oreo’s, cream and all. Use a food processor for the best result. You can also place them in a ziplock bag and crush them with a rolling pin. When the Oreos have turned into fine crumbs, you are done. Prepare cupcake tins with paper liners. You will make 24 cupcakes with this recipe. Prepare the pudding according to package directions and set aside. Transfer the Oreo crumbs to a large bowl. Stir in 6 tablespoons of melted butter and use a fork to incorporate the butter into the cookie crumbs. Place a heaping tablespoon of Oreo mixture in each cupcake liner. I used a 1 tablespoon cookie scoop to simplify this process. Firmly press the crumbs into the bottom of each cup. Next comes the cream cheese layer. Mix an 8 ounce package of cream cheese with a mixer until it is light and fluffy. Add in 2 tablespoons of milk, 1/4 cup granulated sugar, and mix well. Stir in 1 heaping cup full of Cool Whip *see note above if you don’t know what Cool Whip is, or it’s not available where you live. Place a heaping tablespoon of mixture on top of the Oreo layer. Use a spoon to spread the mixture evenly. *Optional – skip the cream cheese layer and use ice cream instead! If you choose to use ice cream, allow it to soften a bit before scooping a heaping tablespoon in place of the cream cheese mixture. Pudding Layer – scoop 1 tablespoon of pudding on top of the cream cheese/or ice cream layer. You will have just enough pudding if you use 1 tablespoon for each cupcake. Use a spoon to spread the pudding evenly. Place 1 tablespoon Cool Whip on top of each cupcake and use a spoon to spread it out. Sprinkle mini chocolate chips on top. Place traditional cupcakes in the freezer for at least an hour before serving. If you are making them with ice cream in place of the cream cheese layer, allow them to firm up in the freezer for 3-4 hours. *Be sure to read the helpful tips above for a few more suggestions. Note: All images shown here are copyrighted and may not be used without written permission from CenterCutCook. I pursue unauthorized use of my work.